So how do we have a Stable Body Structure? To have a stable structure, we begin learning a key principle in Tai Chi: we have to learn how to not use our muscles. That is, consciously train our own muscles not to contract. We experience this in our bodies through the Stationary State (靜態). We have to experience this for ourselves (要体会), because only by applying these universal principles to our own body can we understand what Tai Chi is. A scientific approach to understanding Tai Chi is one of the things severely lacking in this day and age, and this is precisely what we are going to explore. We are learning to have a Stable Body Structure, and this can be achieved when we apply the principles of physics and bio-mechanics to our bodies. 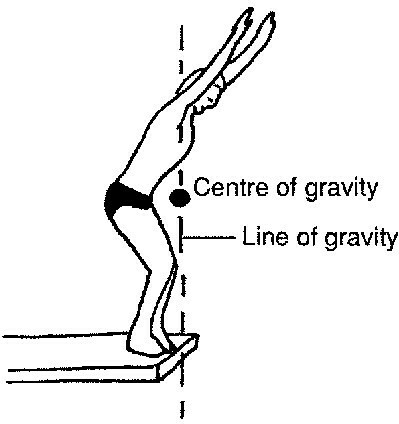 The center of mass is known as the Center of Gravity (重心) . 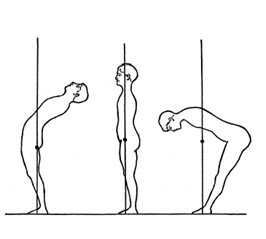 When we first learn about a Stable Body Structure, we maintain a fixed point for our Center of Gravity during our Stationary State. 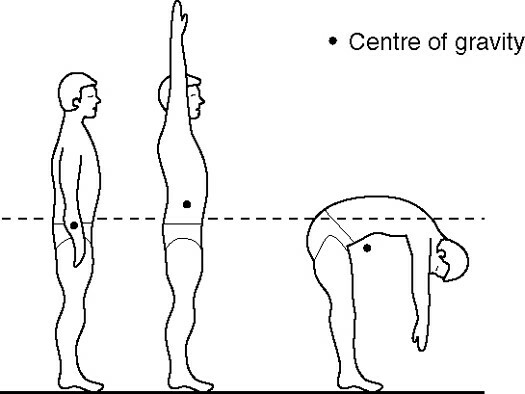 As we begin to move, our Center of Gravity will also begin to move. The direction of the force of gravity travels through our Center of Gravity straight downwards is called the Line of Gravity (重力線 ). As you can see, our Center of Gravity does not necessarily have to be inside our bodies. 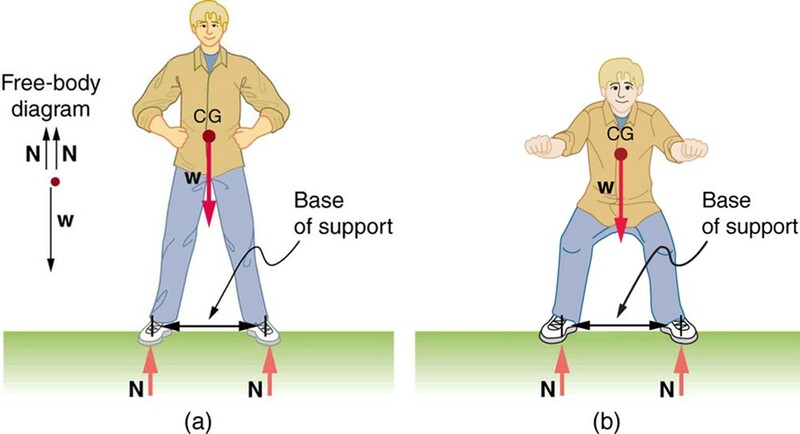 The area beneath us where we come in contact with the supporting surface is known as the Base of Support (支撐底). 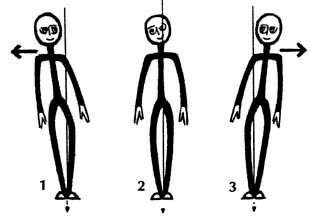 Okay, I understand that we all have a Center of Gravity, that our Line of Gravity is formed when it passes straight down through our Center of Gravity, and the Base of Support is the bottom area where we stand on. What does this have to do with Tai Chi, and entering into the Tai Chi State? We are stable when our Line of Gravity is within our Base of Support. This can be referred to as the Stable Line of Gravity (中線). The Stable Line of Gravity is a cornerstone to learning Tai Chi. We do not want to unnecessarily move our Stable Line of Gravity. When we move away from our initial Stable Line of Gravity (and form a new Stable Line of Gravity), we start to shift our initial Center of Gravity until a new Center of Gravity is formed. This is not stable. Alternatively, we may contract our muscles to maintain our Line of Gravity. But this is not in line with our purpose. A brief recap: Our purpose is to enter the Tai Chi State when we are relaxed, based on the condition of having a Stable Body Structure without using our muscles. As contracting our muscles results in parts of our body being tense, we cannot Relax when part of our body is tense. Wait, so how do we maintain our Line of Gravity without using our muscles? Isn’t it natural that our body will move, even when we stand still? Yes, our body may subconsciously activates our skeletal muscles to try and stabilize ourselves, even when we are standing still. We have to learn about the types of muscles in our body, and how to maintain a Stable Body Structure without contracting these muscles. This is our next lesson. So before we can enter the Tai Chi State, we must have the necessary conditions to enter that state. we have to Relax. To Relax, we should have a Stable Body Structure (框架稳定). We then must pay attention to our Stable Line of Gravity (中線). Yes. We do not use our muscles because we want our body to relax. We use the Stationary State (靜態) to first experience what it means to Relax. But this is merely the start. The Tai Chi State can be better accessed when we are moving. Once we learn to relax our muscles in the Stationary State, we begin to do the same when we are moving. We shift from the ‘Stationary’ State to the ‘Active’ State (靜中求動), so that we can enter the Tai Chi State when we are moving.